The weather was not co-operating. 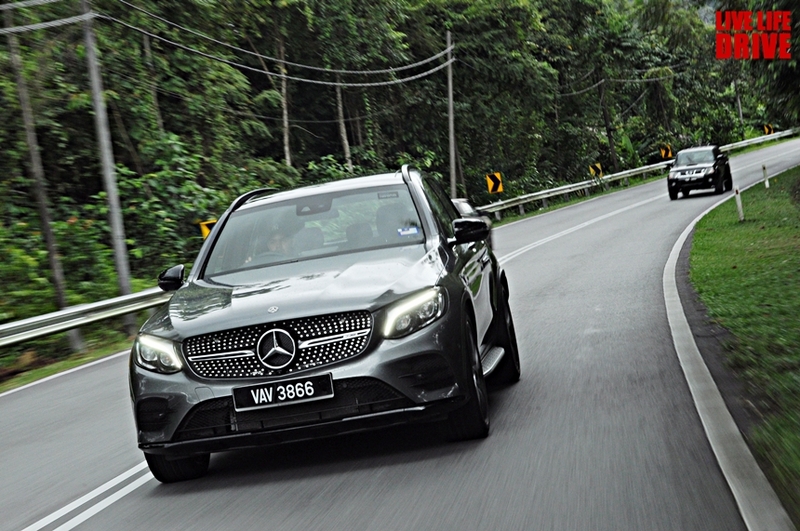 It was our third time on the infamous Ulu Yam road over the course of a week, that quiet time between Christmas and the New Year when everyone is clearing leave, and we were determined to see what the Mercedes-AMG GLC 43 could do when presented with a dry stretch of twisty tarmac. But alas, it was not to be. Early morning showers kept the roads perpetually slick whenever we attempted a run, although we didn’t come this far to be stopped by some inclement weather. Besides, it was rare that we would be presented with roads as empty as these, as most weekend drivers shy away from the rain – their super sticky compound tyres aren’t so happy on wet surfaces. That’s not to say that we were much better off. 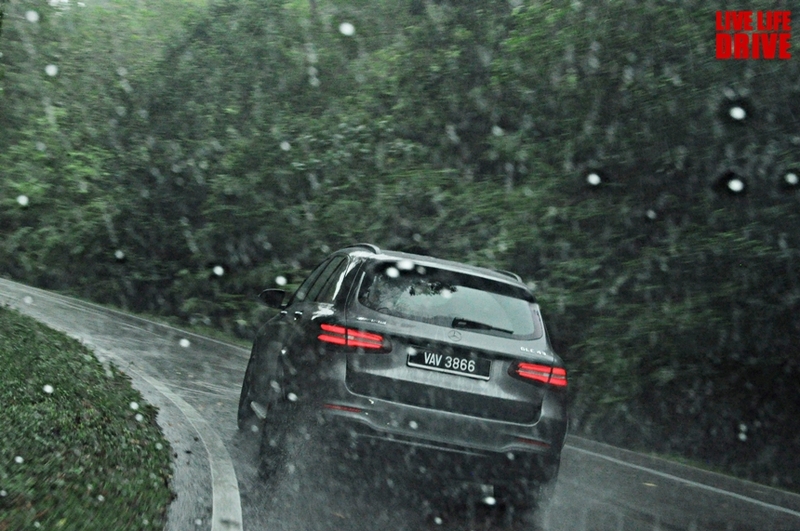 The GLC 43 wears ContiSportContact 5 (CSC5) tyres up front and ContiSportContact 5P (CSC5P) round back – neither of which are particularly great in the dry or the wet. If there was but a single gripe we had with the car from a dynamic standpoint, it would be the choice of tyre – although perhaps Mercedes-Benz never expected anyone to push a GLC 43 to its limits. Nor would most people, for that matter. 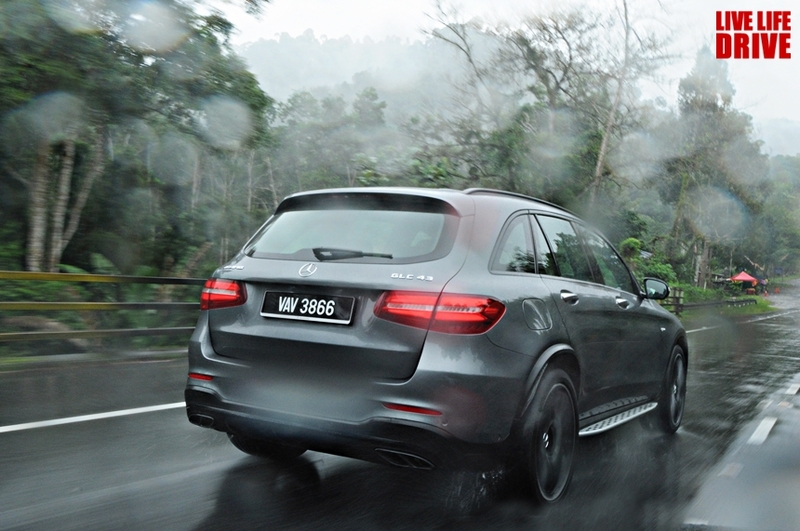 The GLC 43 is, after all, a sport utility vehicle – even if it comes packed with a highly potent 367 PS, 520 Nm 3.0-litre V6 biturbo and 4MATIC all-wheel drive. With a 1.8-tonne kerb weight and a fairly tall ride height, it couldn’t possibly be any good to drive anywhere outside of an arrow straight highway… or could it? After driving the GLC 250 for a brief stint a couple of months back, we had an inkling of what it would feel like when packing a lot more grunt and a few handling tweaks. We set off from the petrol station for the third time that week, thumping across the bridges that marked the beginning of Ulu Yam. In the distance the skies were grey, and the tell-tale signs of a second spell of rain were spotting across the windscreen. We were keen to leave early so that we would beat the regular traffic on the route which would no doubt be slowed down by the inclement weather. There’s a persistent perception that SUVs are incapable of handling in the bends, in the same annoying way that people believe stiffer, lower suspension is inherently better, and that all-wheel drive means all-the-grip, all-the-time. All of these are flawed assumptions, but what we wanted to address was the first. 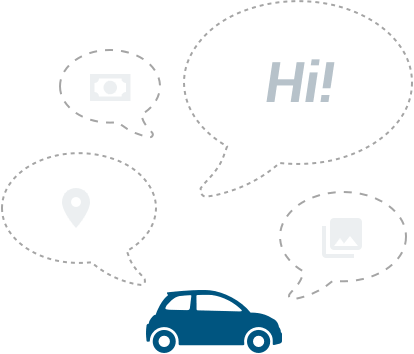 Modern sport utility vehicles are vastly different from their predecessors in the sense that they are now usually based off of passenger car platforms and, especially in the case of luxury brands, are tuned with dynamics and handling as a serious consideration. 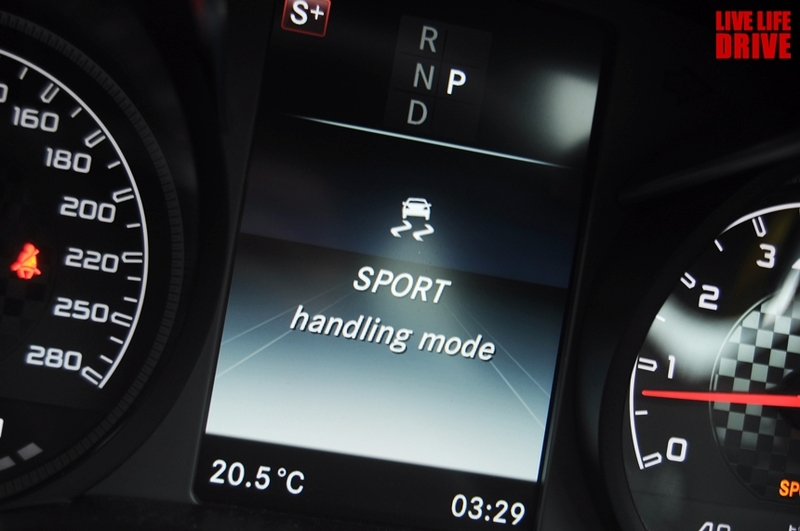 The GLC 43 comes with five different drive modes and three levels for the electronic stability control. In the case of the former, Sport and Sport+ drop the suspension to its lowest settings, helping to lower the centre of gravity while the dampers stiffen up to provide better body control. Even so, it is only as stiff as a regular passenger car, so there’s a mild amount of body roll uncharacteristic of an AMG model. That being said, contrary to popular belief there is nothing wrong with a little bit of roll – it provides a layer of leniency and makes the handling a little more forgiving. 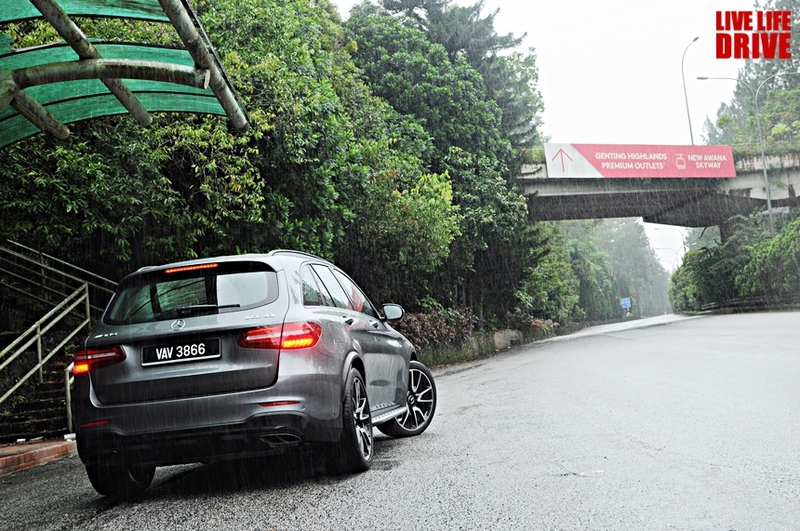 As for the stability control, our previous experiences found it best to leave it in “Sport”. There is no true “Off” mode that allows for any amount of usable rotation or yaw via weight transfer or throttle work, so driving it within the limit of the tyres was our only option. It isn’t the ideal way to handle a car, but with 1.8 tonnes to deal with perhaps a little bit of computer-assisted restraint would be welcome. The only thing to remember is that the car naturally tends towards understeer when you approach the limit – safer, in a sense, but also frustrating. There are those who make fun of modern automatic gearboxes with a large number of gears, but there is a method to this madness. With the GLC 43, the first gear is nearly useless; it helps during hard launch situations or when crawling up steep slopes, but the ratio is so short that you find yourself slamming into the engine limiter with much embarrassment if you try to launch it hard. For that reason, it is the second to seventh gears that are important- largely because they feel like a close-ratio six-speed transmission. 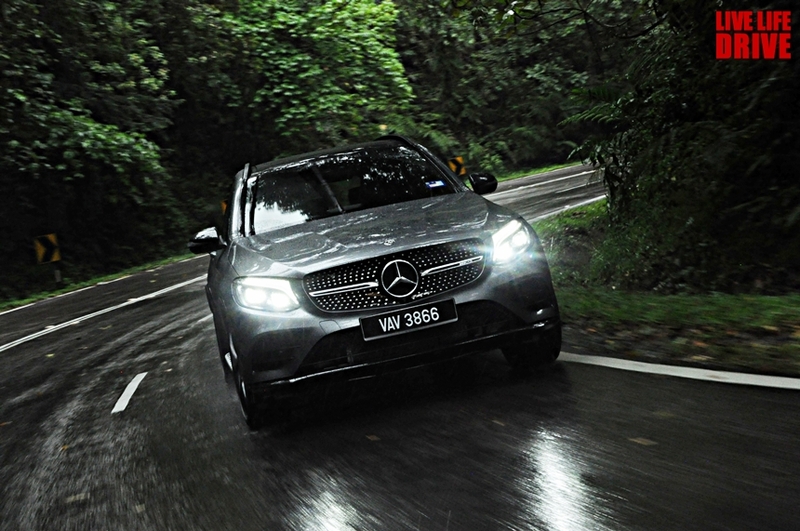 These gears help to accelerate the GLC 43 with rapid, uncanny pace while ensuring the SUV is never out of its torque band, whereas the eighth and ninth gears are to improve efficiency when cruising at higher speeds. When you’re on the throttle it is, for lack of better words, brutally quick. 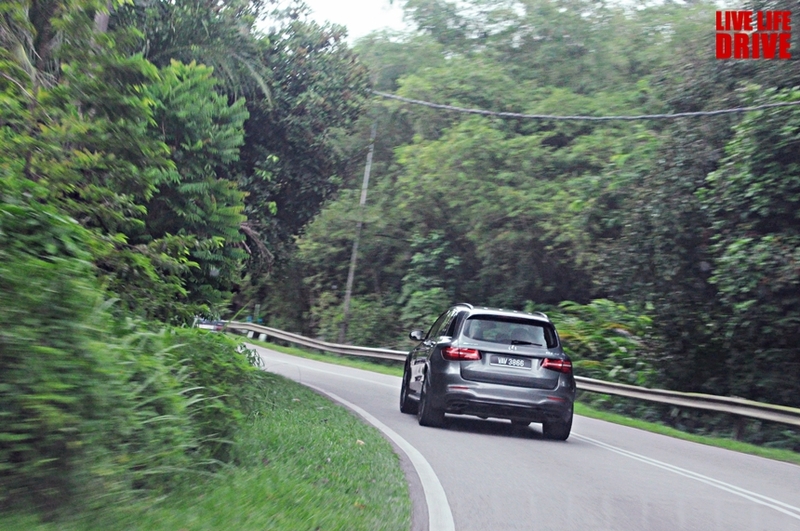 Through the first section of Ulu Yam there’s a steep uphill climb that really tests how much outright torque your car has. A long sweeping left and right offer you a little bit more tarmac to gauge how much grip you have, and of course it felt decidedly greasy on each of those mornings. Even the 4MATIC all-wheel drive system, as useful as you would expect it to be, was doing very little to resolve the lack of grip. We were trying to put as much distance as we could between us and the cars that we had spied when entering the petrol station. Being the last weekend of the year, the Sunday drivers were out in full force. Everything from BMW M3s to Mitsubishi GTOs, incredibly rare Satria Neo Clubsports and incredibly common Honda Civic FCs. There is an incredible amount of diversity in this small slice of car culture in Malaysia, but we digress. The rain was picking up in pace. Wipers set to full speed, we pushed on, treading our way carefully along these slick roads. The GLC 43 does a great job of hiding its weight for the most part, especially down the straights and on corner entry, but its mid-corner where you have to be more precise with throttle inputs to keep it balanced. 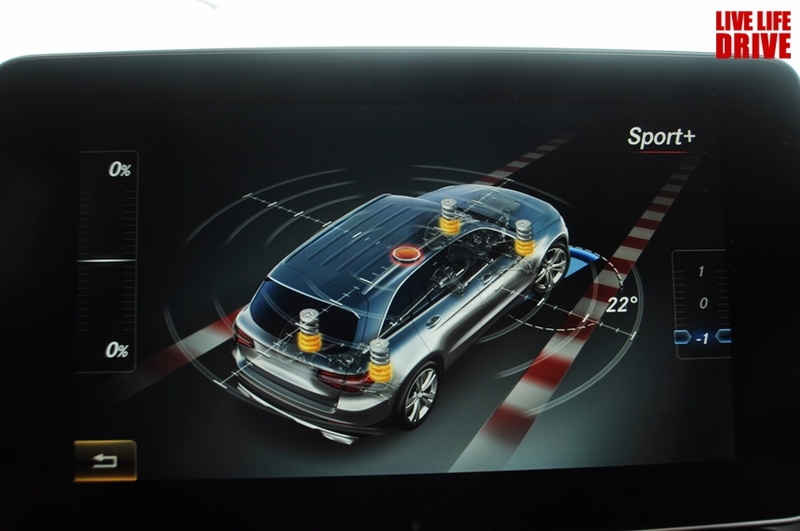 As mentioned before, all-wheel drive systems are not a get-out-of-jail-free card. The Mercedes-AMG system is a little rear-biased which is nice, but accelerating too early in a corner still results in understeer – as it is with almost every drivetrain layout, except a rear-wheel drive with an aggressive LSD. The key then was to stay on top of the car with weight transfer techniques, which is arguably a lot safer than sawing away at the wheel and praying to your deity of choice. 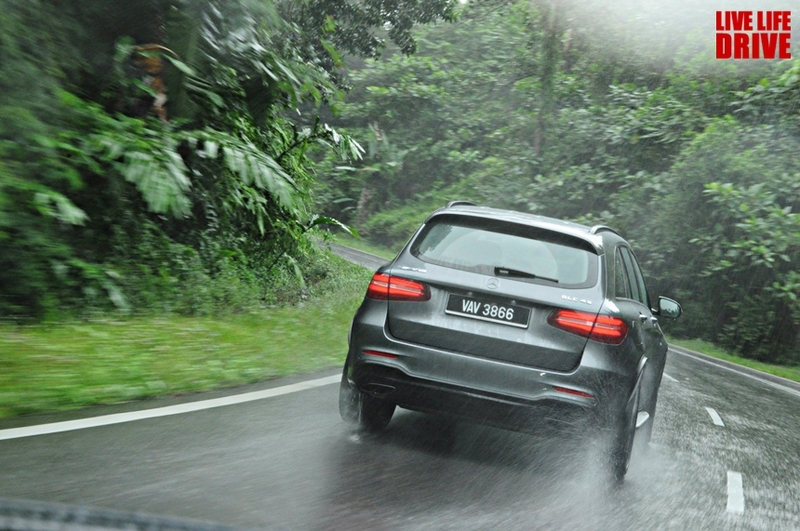 Throughout the low speed section that runs along the coast of the Ulu Yam dam, we were constantly prodding and testing the throttle to get an idea of how much grip we had in reserve. 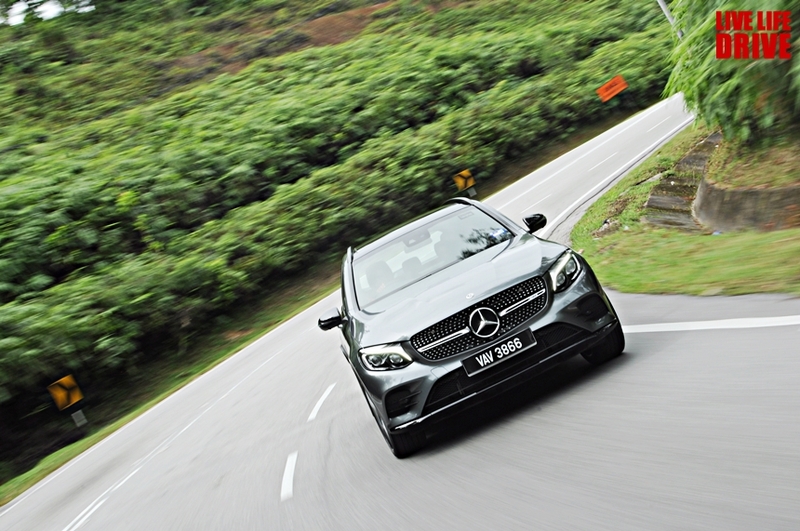 As the road opened up to the medium speed section, we had more room to exploit the performance of the GLC 43. A little bit of regular traffic had slowed us down and whatever gap we had built with the more serious drivers was quickly diminishing. Soon we could see a BMW M3 closing in on us, in a gorgeous Dakar Yellow. Thankfully traffic started to thin out ahead of us and we could pick up the pace, just as the road began to climb more drastically. Once again we were calling upon the GLC 43’s large reserves of torque and just for once, those Continental CSC5s were working in our favour. While our opinion of these tyres remains poor, they were functioning a lot better than the tyres on the M3 which had slowly started to fall behind with each corner. By the time we came down the other side of this mild mountain, we were once again alone with nobody in our rear view. The road was flattening out and after a series of sharp blind lefts and rights, we were entering the high speed section. The rather painful irony about Ulu Yam is that the high speed section is also the bumpiest, and it’s a test of both outright performance and chassis competency. Overly stiff cars need not apply. With each corner the distance to the next corner lengthens and soon we were just two corners away from the fastest straight on the road. There was still a very mild downhill gradient, almost imperceptible, but enough to catapult even a Perodua Myvi to ludicrous speeds. The GLC 43 was firm through the mid corner bumps but still well in contact with the road, and by the time it rounded the final left before the straight it was doing a speed no SUV should have any business doing.  All of this was but a teaser. The real challenge lay ahead, after the town of Ulu Yam Baru and up towards the foothills of Genting – better known as Gohtong Jaya. For the most part the road is fairly high speed with the occasional bend, but there is a section of tight switchbacks where the road widens to two lanes for the uphill which gives drivers a little bit of breathing room and space for creativity. With a huge variety of corners, from constant to decreasing radius along with the odd off-camber bend, this section is highly technical and reveals a great deal about a car’s handling ability. The straight line performance of the GLC 43 had been well established, but it was here that we found that this 1.8-tonne behemoth could dance. The flexibility of the GLC 43 is impressive. One can drive it like a front-wheel drive hot hatch, throwing it into a corner and backing off the throttle for a tighter turn in, or with more smooth inputs to try and move the weight fore and aft, and laterally as each corner is executed. No matter which approach you take, the GLC 43 doesn’t spring any surprises on you – it’s progressive to the limit, and the limit is high. The GLC 43 is no hot hatch. It doesn’t have a Nurburgring claim to fame, it doesn’t have any trick limited-slip differentials, nor is it capable of tail out antics. It isn’t a mid-engined corner carver that can be driven purely with the throttle pedal. But the GLC 43 is incredibly competent and surprisingly agile, it’s a great balance of performance and poise, and it always gives you a sense of control. These are inherent traits of the GLC models, and while they share the same base platform with the C-Class, the suspension stroke and geometry help to alleviate any uneasiness that one gets when pushing lesser C-Class variants to the limit. Having a 367 PS at your disposal is just a very welcome bonus.